To our valued customers, we have some exciting news for you! We're thrilled to announce that we're integrating our sister company, PaperPro® into the Bostitch® Office family. Moving forward, we'll be bringing you all of the same PaperPro® products you've always known and loved, just with Bostitch logo and packaging. If you're new to PaperPro® and its amazing products, learn more by clicking here! Whether you're a fan of patented one-finger™ staplers or reduced-effort hole punches, never fear—your favorite products aren't going away, they're simply getting a new brand! All of the PaperPro products are going to maintain the same design and technology, they'll just be getting the Bostitch logo and a new packaging look. Plus, all of the model numbers are staying exactly the same. So, whether you're searching online or in-store, you'll be able to get the exact same product you've always loved. Already own a PaperPro® product? Never fear—your warranty will carry over with the brand change! While this transition has already begun, we expect to have all PaperPro® products rebranded with Bostitch® logos and packaging by June of 2019. Can I Still Purchase from the Same Places? Absolutely! While you may be seeing new logos, images, descriptions and packaging, the products are 100% the same. Looking for that PaperPro® spring-powered magic from the inPOWER™+ 28 Premium Desktop Stapler? 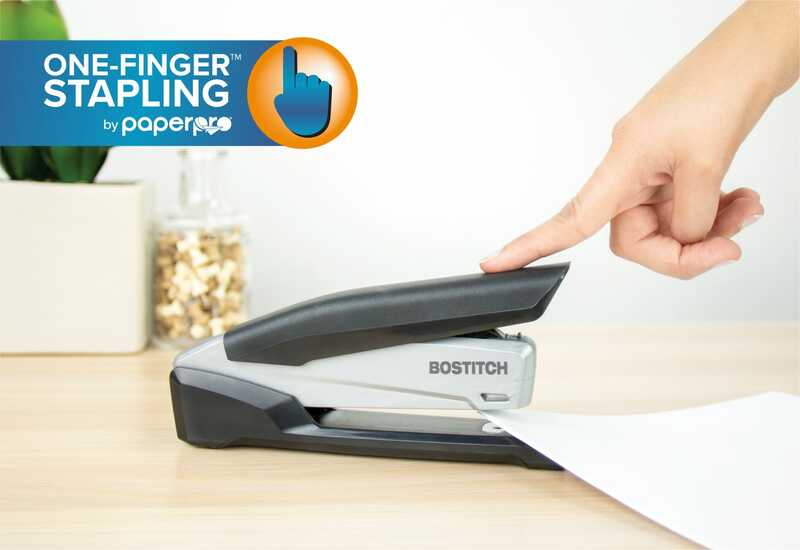 Well, look no further than the Bostitch InPower™ Spring-Powered Premium Desktop Stapler for that same stapling magic. We know you depend on the ease of hole punching with the PaperPro® inPRESS™ 40 Three-Hole Punch, but with PaperPro® technology, you can now depend on the Bostitch EZ Squeeze™ 40 Three-Hole Punch to cater to all your punching needs! If you have any questions or concerns about this change, please reach out to our customer service team!